It's unlikely that I'll add other graphics but it looks like I have some geek fandoms to catch up on. Vanya brought up some great ideas. This *is* the perfect opportunity to tie in/nod to Chrono Cross a bit more. As far as the time traveling from Final Fantasy I, Garland would be perfect- this way there are some villains hanging out as well. I don't know if I'm a fan of bringing in characters from totally non-squaresoft sources. There are already examples of squaresoft characters crossing over into each other's game worlds, but having Dr. Who etc would just scream HACK too loudly for my tastes and take me out of the experience. Though after seeing this, we should all be glad that he isn't in the Chrono Trigger series. This will be a work in progress, so there will still be time for suggestions after release. Spekkios door enters the bar. Hmm... not sure I like the idea of outside crossover references like Kingdom Hearts finding their way into this hack. It is of course your hack to do as you wish, but I figured this project was going to stick to purely the CT universe and basically add & improve upon it, which it has done thus far very well. I'm not against crossovers, I mean I basically made one of my own lol, but for this project I think it might not be a good idea. I'd say instead of Heartless to try and create something original that would seemingly work within the CT universe, like Time Demons, for a basic example. The "Project Leader" of Flames of Eternity kind of ruined Crimson Echoes by adding a ton of outside references to the dialog, and I definitely don't want to see that happen with this one! Just my 2 cents. I think the Heartless reference makes sense, considering both Chrono Trigger and Kingdom Hearts are Square Enix IP's. Despite KH being their collaboration with Disney (Which is one of the things that makes KH so special) and the fact that Lavos can destroy an entire world just fine. You don't even have to go that far, Lavos destroys worlds just fine on his own. I'm going back home next week which means a lot less time to work on this so for that reason the party is going to be in the beds for this release, when I get more time I will wake them up and give them some more interactions. I added some npc's to the bar, they're a mix of generic statements a few profound statements about a nature of the area, one very subtle reference to Hitchiker, and my KH reference which wasn't as well received as I'd hoped, perhaps if I added real Disney characters? People will have different opinions on the matter, but I like the idea of bringing other Square game references into that area. If executed properly and contained to this location. There are quite a few crossover characters in Mario RPG, both Link and Samus make cameos. While Culex is an original character to Mario RPG, he and his elemental crystals and musical themes are clear homages to Final Fantasy. If you do reference Kingdom Hearts, i'd recommend you only use characters and content created by Square FOR the KH games. Leaving Disney's characters and references out, such as Mickey and the gang or any of Disney's movies or cartoons. I have an idea that may not be possible or feasible, but i'll throw it out there anyways. Is it possible to insert NEW character sprites (not just recolors of existing Chrono Trigger sprites) into this scene? If so, you could have a character sprite who is wearing a black hooded Organization XIII coat. This would serve a variety of purposes. The sprite would be an explicit and recognizable visual reference for fans of the KH series. And story wise it would simultaneously hint they're an important character while also keeping their identity a mystery. But a cloaked figure would also provide more subtlety than seeing a specific KH character like Sora or whatever just hanging out there. 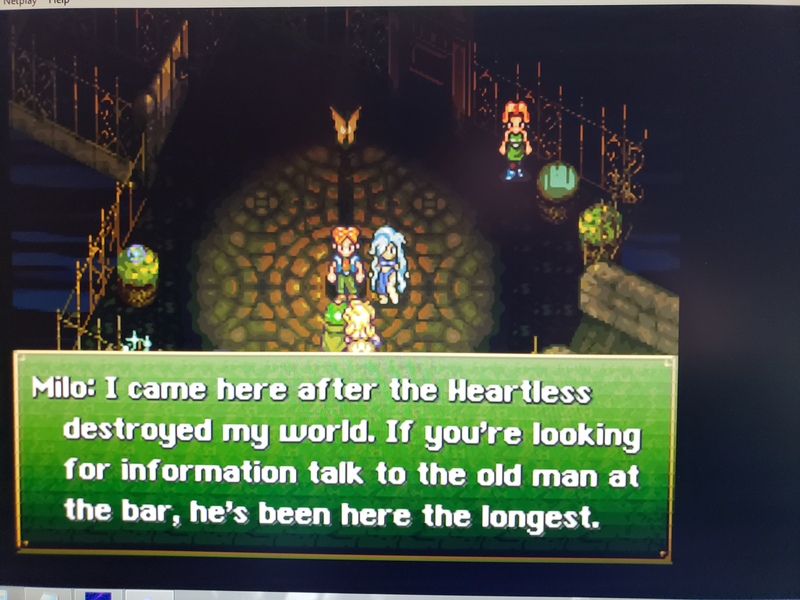 If this sprite change was possible, you could also change the dialog to something like "My heart guided me here after my world fell to darkness". You wouldn't even need to mention heartless, that phrase would immediately get the reference across to KH fans while also not mystifying and putting people off who aren't knowledgeable about KH lore. Tie in whatever you like. Secret of Evermore referenced Final Fantasy. These sorts of things are and can be fun. Samus in Super Mario RPG didn't make a lot sense, but neither did the Final Fantasy boss there either. It's fun extra stuff. I just didn't get the reference. I'm thinking that when I have more time I'll probably change what npc's are at the EoT as the story progresses. So, the trick to nailing easter egg cameos is first having their appearance make sense and using what I call pseudo-subtlety. First, just have their appearance make sense. Chrono Trigger does this already with Biggs and Wedge who vanish out of thin air in Final Fantasy VI. Turns out they weren't disintegrated, they were transported. The game doesn't get into the specifics of how they got their. The Final Fantasy fans infer this knowledge from seeing their demise during Final Fantasy VI. Another thing is their appearance didn't need to be modified to make them recognizable as that specific incarnation of the pair because CT's release was so close to FF6's. Their names were enough. Which brings me to my second point about pseudo-subtlety. Unless, the character isn't both owned by Square and has a good reason to be their they should get either a name drop it custom graphics but not both. Video games bend the 4th wall in this way all of the time. Fans have come to expect it. However, when they do so with characters outside of their IP, they never break this rule. While you aren't legally bound to this expectation, your players are used to it and any changes from that norm will feel out of place. Take Doctor Who for example. A police box would fit fine on the street corner at the end of time. You could even have a suspicious looking bloke in a bowtie looking for Amy and Rory. But if he were to introduce himself "Hello, I'm the Doctor. Have you seen my friend's Amy and Rory around? I seen to have misplaced them." It suddenly feels forced. However, let's see what happens when we see this unnamed character, bearing a distinct likeness to Matt Smith, pacing, scratching his chin,and muttering to himself, "Damnit Amy. Where have you and Rory ran off to now?" Now, that feels lighter and more fresh right? It doesn't over-engage the player with needless details because it's not part of the plot. Just remember, unless there is an actual story arch that makes sense, a little cameo goes a looking way. As far as references goes, this game is multidimensional. So if it sounds far too out of place (as long as it doesn't overstay it's welcome), blame the End of Time. Actually, Cross did just that with the Ozzie/Slash/Flea battle and some other things. For sure keeping the references subtle is best. Medina 1999 is coming along nicely. Biggs and Wedge aren't FFVI references, they’re Star Wars ones. They’ve been in almost every FF. Also, hate to be blunt but there’s nothing subtle or “pseudo-subtle” about your example of a reference. It’s weird and out of place and is just gimmicky in a hack. That kind of stuff might go well in an original game, but speaking for myself, whenever I see stuff like that in hacks the best it gets from me is an eye-roll. Keeping things in-universe is the ideal situation I think. What Undertale does really well is all the monsters that get spared end up as characters in the world you can talk to. Why not stick Azala at the End of Time to wax poetic about their defeat? Yakra? Queen Zeal? Anyone. I don’t get the point of sticking in random unrelated characters into the hack other than making a small portion of the already incredibly small group of people who will play this hack a quick, forgettable chuckle. As others have stated, though, it’s not my hack so you can put in whatever the heck you want. I just think the Chrono universe has enough interesting characters to chuck into the End of Time without gimmicks like this. Biggs and Wedge are are simultaneously a reference to Star Wars AND Final Fantasy VI. It is plainly obvious that they built on the original reference in FF6 by also including a reference to Captain/Admiral Piett. Further more, the original reference has since been repeated in most Final Fantasy games since then. So at this point it is well established as a reference to characters within Final Fantasy. The distinction Timbo made is objectively sound and makes perfect sense. And more importantly speaks to how to do these references in a way that is less "gimmicky" as you put it. And besides that, this new content is nearly as innocuous as developer's room or any easter egg.